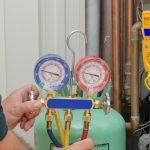 One of the most common questions asked of HVAC technicians is, “How often should I replace my central air conditioner system?” The answer truly varies based on many different factors, but there are some general consistencies and guidelines to follow. Here’s what you need to know. Most of the air conditioners built today will last somewhere between 15 and 20 years before they’ll need to be replaced. Even if these systems are built with the best and highest-quality parts, something will come along in the next two decades that will render it inefficient. For this reason, most HVAC technicians will recommend replacing any HVAC system that is 15 to 20 years old with a newer, more efficient model. Most of the time, doing so will help you save money in the long run, even if the initial investment is a little more than you’d planned for. Even if the average air conditioner lasts 20 years, the truth is that this is an average. Some may fail after just 10 years, and others may last for 30 without so much as a single repair if they’re well-maintained. If your central air unit is getting up there in age, and you’re paying for at least one major repair every year, then it’s probably time to think about investing in a new system. The money you’re spending on repairs will add up, as will the inefficiency of a system that isn’t performing optimally. If a technician recommends that you replace your HVAC system with a newer model, it may be worth it to obtain a second opinion, if only for your peace of mind. While systems that are 10 years old don’t always need to be replaced, there are some circumstances in which it may be the best choice. If the system wasn’t well maintained during its lifespan, or if it is especially inefficient, replacement may just save you money, and very quickly, at that. Your technician should discuss all your options with you and help you make the right choice for both your budget and your comfort needs. Part of making the choice to repair or replace a central air conditioner system involves getting information from a company you can trust. This can be tough, especially when you have so many companies from which to choose locally. A trusted reputation and great customer service are the two main qualities you’ll need to look for. After all, if previous clients and customers are happy, then there’s a good chance you’ll be happy, as well. 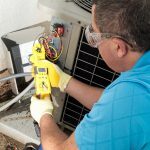 A central air conditioner system usually lasts 15 to 20 years before it needs to be replaced, but in some cases, it may need to be replaced sooner. Just because it’s still running doesn’t mean you should continue to use it – inefficiency can be a major expense by itself.